I ordered my own iPad2 on Wednesday October 5. I only found out later in the day that Steve Jobs had just died. We’ve all had a chance to review his life on TV newscasts, TV specials, online articles and analyses, and tributes. The number of tributes exceeded anything I hoped for or expected. Even at news sources I normally distrust, coverage was positive yet balanced and told a remarkable story that will be retold many more times in coming decades. I think iPad2 turned out to be a brilliantly fitting way to launch the post-Jobs era. It embodies all the design elegance, under-the-hood power and user-friendly simplicity he devoted his life to. 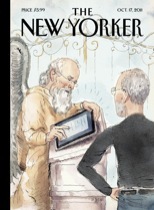 But this post is about my first impressions of my iPad, even though its rationale is for me closely connected to reading my weekly The New Yorker on iPad and, eventually, all my other periodicals. I was introduced to my first hands-on iPad experience by a friend whose eyesight issues may be worse than my own. He bought iPad to help rectify that. I find myself limiting reading sessions with print periodicals, either because of poor-quality newsprint, or lighting and glare issues with high-quality glossy magazine pages such as are mailed to me by The New Yorker and National Geographic. My friend says he can’t read a regular newspaper at all any more. I get all my in-depth news online, and for free, at sources such as BBC, Huffington Post, The New York Times, Los Angeles Times, Scientific American, PolitiFact and MarketWatch. I’m fine with reading news on computer flat-screen panels. But I never cared for being chained to a computer chair to read books or magazines at length. I’ve already started downloading my The New Yorker issues to iPad, and find them eminently easier to read and navigate than those paper editions. This is a vast improvement over early industry efforts to find a suitable ebook format for periodicals. This concludes the saga of “BIOS Won’t Boot“, a most unfortunate sequence of events occurring on April 1 (yes). The story was posted here April 8. On April 11, Sunday afternoon, the second day of my return from Phoenix, you couldn’t tell there had ever been any issue(s) on my Castro Valley machines, and I didn’t have to spend a nickel to replace any hardware, either. It’s always nice to have the spare 3V CR2032 BIOS battery I bought for this occasion in Phoenix, wouldn’t you think? But I didn’t need to use it. I’m in Phoenix at the moment, returning to the Bay Area tomorrow. I’m staring at my newly rebuilt Windows 7-64 PC, which is working great. It’s dawning on me that when I shut it down tonight I won’t need to say good-bye. Taxes are due in a week and my PC up north died. I’ll be packing the car tonight for the drive north. In addition to the usual travel stuff, I’m packing (1) a CR2032 3V Lithium CMOS battery, and (2) this PC. I just lugged this PC down here to Phoenix last month. Since I’m moving here soon anyway, lugging the PC back north with me just seems counter-intuitive. Yes, I also have a fast Mac Pro up north, but all my tax stuff is on the PC. Usually, when I post one of these “this happened to me” articles, there’s a moral to the story. In this case, I don’t know what it is yet. The PC failed just when I had to get a night’s rest for an early morning drive south. If I had to guess what the moral of the story will turn out to be, NOT forcing Windows shutdown with the Power Button would be high on my list! Here’s the story (or what I know of it so far), excerpted from a letter to a friend. There’ll be a follow-up post once I do the diagnostics and fix the problem with whatever it takes. I have a new Windows7-64 up north too, and I love it, but I may have to do all that over again too, if not very lucky, as soon as I get back next Friday. Less than 12 hours before I had to leave for Phoenix, I was on the phone with Comcast cable/internet to get them to reset my new modem again. Some browser intercept feature of theirs was hijacking my browser on all 3 CA machines – a Mac and two PC’s. 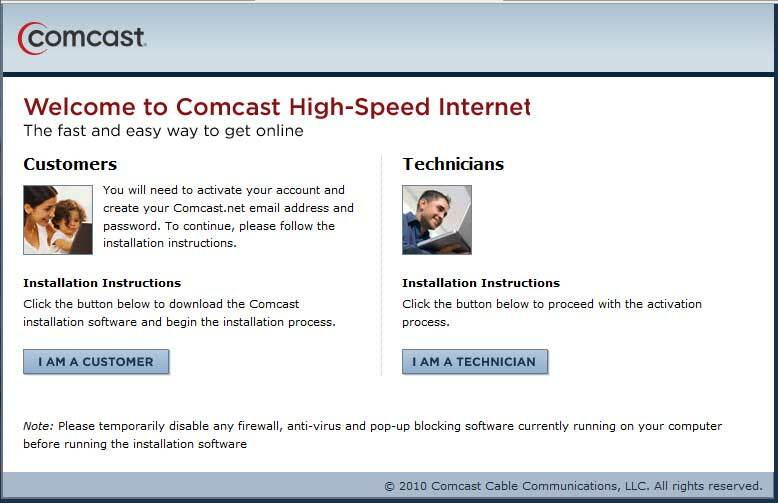 Their tech guy reset the modem, got customer service to update something or other that should make the “hijack” screen go away, and he had me shut down and reboot the machines. This fixed the problem in the Mac and the old XP machine. The Win-7 machine refused to shut down. After several minutes, I forced it off with the 5-second Power Button trick. I don’t like to do that, and normally don’t. 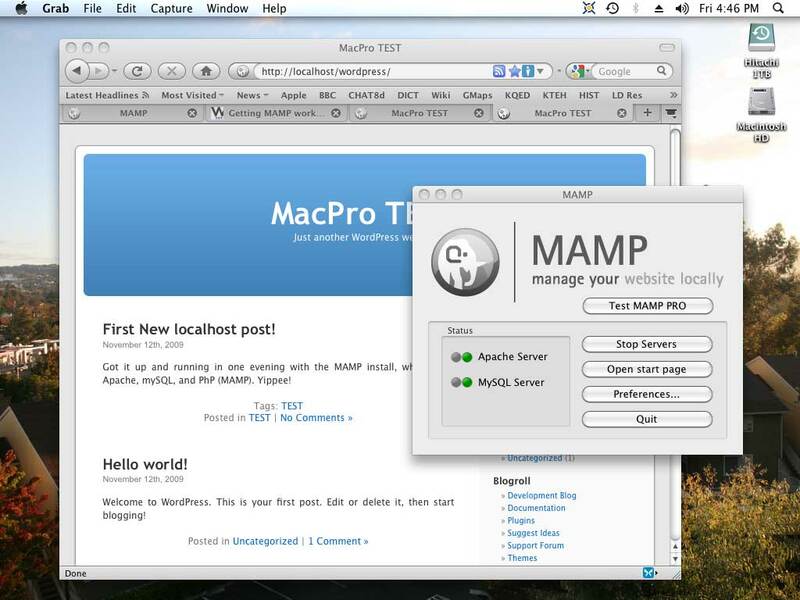 First test WordPress installation on local Mac machine. Click image for 1024×768 view. Pictured above is a test WordPress installation running on a desktop Mac. 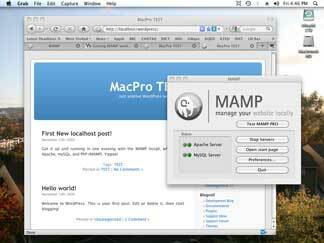 It’s running under a free development environment for Mac called MAMP. No internet connection or remote server uploads are involved at all. Upgraded memory to 7GB (+3[2GB] SIMMS + 1 existing 1GB) – removed two 1GB’s to fill 4 slots. I’m really impressed. five stars. Let me state up front that this Mac exceeds my wildest expectations. It’s everything I wanted, runs incredibly faster than any PC I’ve ever owned or built, and the software is everything you expect from Apple, if not more. Having jumped ship from a Mac Clone to PC’s in 1997, I have a lot of investment in home-built PC’s, a huge software environment, and considerable PC “learning curve” acquired in the last 12 years. But I’ve always wanted to install a test server right on my own box. I’ve been uploading drafts to test regions on my server for years and testing them there. Of course I do a lot of WordPress nowadays, a great, no-brainer web-based solution for blogs and entire websites. But, of course also , I still customize with Perl and HTML, I’m starting to use PhP, and I’m thinking about jumping into Ruby/RAILS. My mom used to irritate the heck out of me with this old quote, attrtibuted to caustic French critic, journalist and novelist Alphonse Karr (1808-1890). I will grudgingly admit that, with the passage of time, it seems as true as ever. Digging through some old notebooks, I found a forgotten printout from ten years ago. I bolted from the Mac platform to the PC in 1997. I upgraded my first PC hardware in 1999. Principally, I replaced the original Micron motherboard with a newer, faster ASUS board. My letter to a friend follows below. The motherboard upgrade went very well. The mechanical part was a piece of cake, and I took my time. Windows took awhile (several restarts) to get used to the new motherboard. It wanted to install a few drivers that should have already existed. It didn’t help that I got confused about which drive letter it had assigned to the CD-ROM with the Windows disk and drivers. I put in a different Ethernet card, and had to reconfigure the TCP/IP to get back onto PacBell DSL. I think we must all admit we’ve come a long way in the past decade of technological breakthroughs. With 45-nanometer chip architectures and 3.0+ gigabyte CPU clock speeds, Windows startups do seem slower than ever. AMD CPU retail boxes have always come with generic cooling fans, and, if you’re not overclocking – I’m not – I have found them adequate in the past. So I quit looking for the “perfect cooler” like the Swiftech MCX462, which I experimented with in 2002. (I yanked it, because it sounded like a NASA liftoff. See the preceding link to my article). So when the alarm went off last week, I searched this room in the apartment until I found the ceiling smoke alarm, and its 9V battery indeed was shot, but when I replaced it, the alarm didn’t stop.